Er zit nog iemand op een verjaardagskaart van mij te wachten, dus heb ik voor het eerst de uitdaging op Gothic Arches aangegrepen met het thema van deze week Asian. Achtergrond geaquarelleerd, bamboe is met Versamark en chalks gedaan. Stempels van Impression Obsession (krullen), PSX (geisha), Hero Arts (kraanvogel), Technique Tuesday (bloem/ster), Hampton Art (bamboe & tekst). 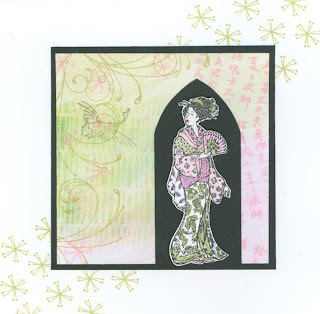 There's somebody waiting for a birthdaycard from me, so for the first time I took the challenge on Gothic Arches with this weeks theme Asian. Background is watercolored, bamboo was done with Versamark and chalks. Stamps from Impression Obession (swirl), PSX (geisha), Hero Arts (cranebird), Technique Tuesday (flower/star), Hampton art (bamboo & text). Lovely card and clever use of the arch! Beautiful image and background, Christa! Hi there, I saw your question about the SU stamp set of the branch. I don't have the name on the box, but it says it is 2006. It is 6 small stamps in the shape of tags. The one with the branch says Thank you. I can take a picture of them if you want to send me a e-mail. Wow this is fabulous. Great card and arch. de kaart is prachtig Christa!!! I like how you used the elongated arch shape! That's a brilliant take on the challenge... did you have fun with it? *g* I'm sure they'll love your card! Ik vind 'm geweldig. Heerlijk om zo'n kaart te ontvangen!!! this is so soft and pretty! love the muted colors you used! beautiful!